Queen Nefertiti and King Tutankhamen were both 9 years old when they were married. At the time they were too young to make political decisions so an aged Vizier named Ay made the decisions. He had Tutankhamen restore all of the temples that had been damaged during the religious revolution that was led by his father. Tutankhamen would die under mysterious circumstances just nine years later. Many believe he died at the hands of Ay, who almost immediately married Tutankhamen's widow. Tutankhamen was followed by King Horemheb who was a commoner and head of the military. Horemheb left no children as heirs when he died. So instead, a former army associate of his named Ramses would assume the throne. Ramses would found the 19th Dynasty, and rule for just 2 years. His son Seti I, would rule for 13 years. Seti I appointed his son Ramses II Prince Regent at age 14. Ramses II would ascend to the Egyptian throne as a teenager. During his first 10 years of rule Ramses II repeatedly warred against the Hittites and the Kush-Nubians who had taken Egyptian territory. He would win numerous victories against them. In his second year of rule Sherdan sea pirates were causing havoc along Egypt’s Mediterranean coast. The pirates had been relentlessly attacking cargo laden ships that were destined for Egyptian ports. Ramses had his men lay hidden in strategic points where they waited until the pirates appeared. Then, when they got their chance they surprised the pirates in a great sea battle that took place near the mouth of the Nile River. In one great sweep Ramses captured them all. Ramses controlled one of the largest armies that the world had ever seen. He had an infantry of 20,000 men who wielded axes, spears, and swords. The infantry was supported by a highly trained chariot corps with another 20,000 men. At this time the Hittites controlled the city of Qadesh, and they ruled over the area we now refer to as Turkey. The Hittites used a heavy 3 man chariot in battle. 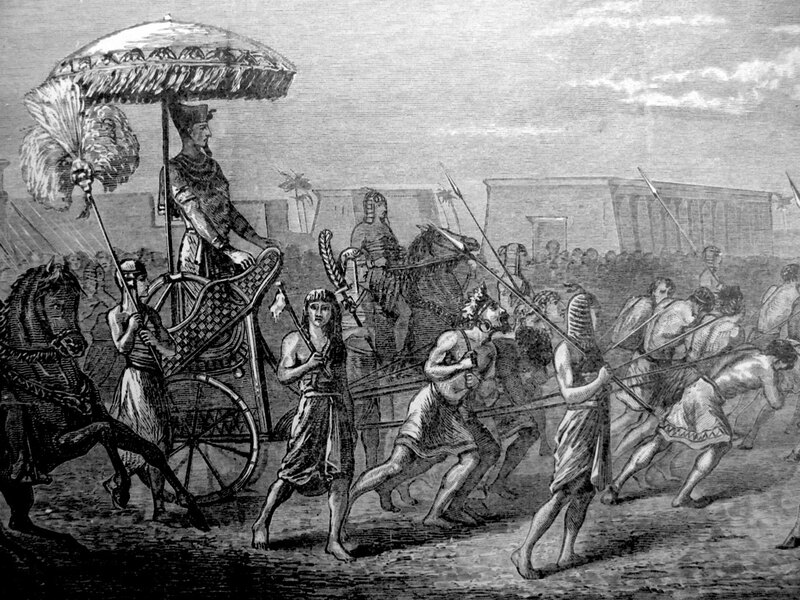 Their chariot was manned by a driver, a shield bearer, and a javelin thrower. Ramses used chariots that were manned by archers who could do great damage from a distance. When Ramses and his forces approached Qadesh they were told that the Hittite leader Muwatallis and his army had fled in fear and were now 120 miles away. However, it wasn't true, instead Muwatallis and his 40,000 men were about to ambush the Egyptians. The Hittites attacked just as Ramses Ra Division was settling down. Immediately, the Egyptians were overrun. However, Ramses was not about to be defeated. He rallied his troops by taking the reigns of a chariot and charging straight into the Hittites. His actions gained his forces just enough time to allow reinforcements to arrive. Ramses would charge the Hittite forces six times until they retreated. Then, as both sides prepared for one final great assault Muwatallis realized that Ramses could not be stopped. He offered a peace treaty, and both sides agreed to never fight again. Ramses would spent much of his final years constructing amazing temples and monuments. Many of these were devoted to his military successes. More statues, temples, and monuments bear his name than any other pharaoh. No one knows exactly how many wives he had but he left over 100 children. His 13th son was named Merenptah. Merenptah would succeed his father on his death and rule for 10 years.